Engaging the Senses What’s the point of visual aids? I think that it’s about engaging more of your audience’s senses than just hearing you speak. What’s the point of visual aids? I think that it’s about engaging more of your audience’s senses than just hearing you speak. 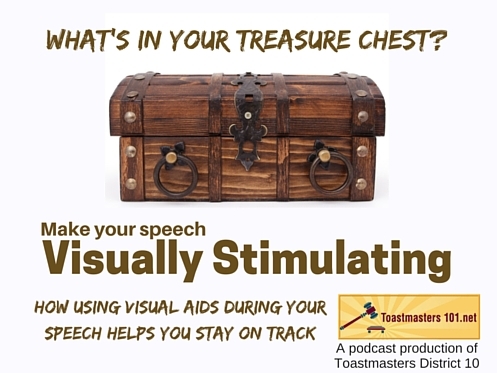 A visual aid adds a layer to your speech that your voice or body can’t add. It’s not just about handouts or PowerPoint images. Your goal is to bring your audience to a different place than they were before you began – and sometimes, an image or an object can do it faster and more effectively than words. Pictures are worth a thousand words? So then might a good visual aid. Better than just one sense, try to engage many. When I had to give a presentation about Toastmasters club officer roles, I stopped by a local bakery and bought my visuals – bread rolls. The smells captured my audience as much as the sight of blueberry muffins and cinnamon rolls. Yes, I will stoop that low for a good pun. What’s a Good Visual Aid? A good visual is big enough for the audience to see and understand. That’s pretty much it. This is why so many people go for the PowerPoint presentations – they can use little objects but make them big enough for the back row to see. I prefer color to pale or pastel visual aids, but that may just be my inclination to bright colors. If I needed a ping-pong ball, I wouldn’t go out of my way to find a colored one. A good visual aid is not distracting to the audience when it’s not in use. Don’t carry it when you’re not using it. If it’s unstable, like a ball on a table, then figure out a way to prevent it from rolling and upstaging your speech. There’s an old theater story about an actress who was fighting with her co-star. She entered the scene with a full glass of wine in her hand, and when she left the stage, she strategically placed the goblet on the edge of a table, where the audience couldn’t miss it. When would it fall? No one paid any attention to the actress’s co-star – they all waited for the wine glass to fall. It never did – she’d prepped with a piece of tape on the table top that would hold the glass in place. Make sure your visual aid doesn’t upstage you! Using a box to store your visual aids can be a way to create curiosity in your audience. Decorate the box in some way to market your message – don’t let any opportunity to influence your audience to get away from you. I recommend Andrea Ambam’s excellent, winning speech from the National Speech and Debate Association 2014 competition. Remember that the NSDA standards are not Toastmasters’ practices, so this speech isn’t in our usual format. Nevertheless, it’s a beautiful speech!